There are a wide range of industries that benefit from the utilization of sheet magnets. Sheet Magnets – Master Magnetics, Inc. Automotive and consumer industries use sheet magnets, which are fairly flexible magnets, primarily for signage, although there are many other applications. Sold in bulk rolls or cut sheets, sheet magnets consist of two sides, one which is magnetized (the strong side) and the other which is not (the weak side). Since flexible magnets are actually a plastic polymer composite, the lifespan and magnetic force of magnetic sheets are much lower than in other non-polymer magnetic composites. 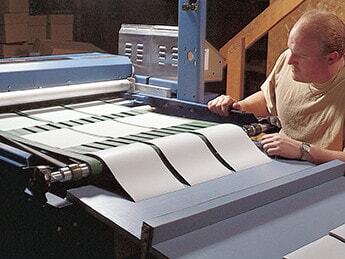 As a result, sheet magnets are a flexible ferrite-plastic composite which is extruded into magnetic sheets onto which adhesive and/or print is applied. These sheets are then cut to custom shapes and sizes and used for a variety of applications, including refrigerator magnets and displays, magnetic calendars, magnetic business cards, automobile signs and advertisements and many others. Sheet magnets are available in a wide range of widths, thicknesses and sizes; thicker magnetic sheets have greater magnetic force, since greater magnetic force is contained in greater mass. Due to their flexibility and flat surface, sheet magnets are ideal for advertising and other applications which require large surface areas to hold weak magnetic force. As a polymer composite, sheet magnets are made of the same material as injection molded and extruded magnets, which are other types of flexible magnets. Injection molded and extruded magnets can be formed, just like plastic, into a virtually limitless range of shapes; the cost of magnetic polymer materials and magnetic polymer extrusions are high, however, and magnetic polymer products have relatively low magnetic force. For this reason sheet magnets, which are more easily extruded than magnetic polymer shapes, are far more cost effective than any other type of magnet and are by far the most common in consumer industries. To enhance a sheet magnet’s magnetic properties and lifespan, sheet magnets are often laminated on the weak side with a top-coat to keep magnetic properties from seeping out. The most typical top-coat is vinyl, which is often glossed, colored or printed. Rubber and acrylic are sometimes used to coat magnetic sheets as well. Sheet Magnets Sheet magnets are large, flat magnets that can be used over large surface areas. A magnet is roughly defined as an object that is surrounded by a magnetic field and that has the property of attracting either iron or steel, and it does not matter if that property is natural or induced.